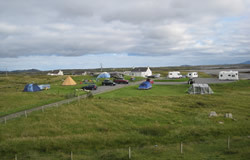 Moorcroft Holidays is a small family run campsite situated 1 mile south of the village of Carinish overlooking a tidal bay with panoramic views of the neighbouring hills of North Uist, South Uist and Benbecula. Several sites of historical interest within easy walking distance. The facilities include a purpose built heated amenities block with disabled facilities, campers kitchen, laundry & waste water disposal point (biodegradable additives only). Our motor home/caravan pitches are all hard standing and have electric hook up. The original crofthouse and family home has been converted to a small bunk house offering twin room accommodation.